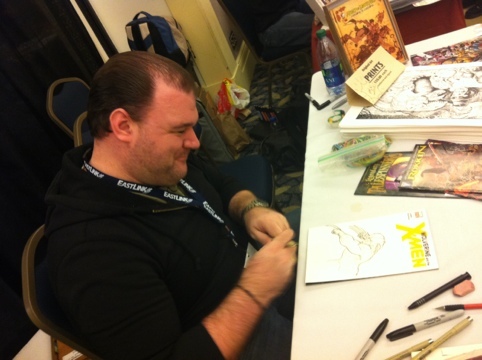 The other neighbor I had at Hal Con 2011 was non other than Marvel Comics artist Nick Bradshaw. And while I was a little jealous of the attention he got as prepared to my booth (though I understand it), I wouldn’t have passed up the chance at meeting him for the world. Nick is currently working on Wolverine and the X-Men, one of the many new titles to come out of the X-Men: Re-genesis storyline. While I haven’t actively followed X-Men since Claremont re-took over waaaaay back in X-Men #100 and trashed everything I loved about the series, I have been keeping abreast on everything X over the last decade via web blogs and wonderful website such as UncannyXMen.net. Nick’s work just blows me away. I saw him doing some sketches for fans (and am cursing myself for not asking for one) and the speed yet skill with which he works is simply astounding. One of my favorite artists in comics in Chris Bachalo, and I was shocked by how similar their styles were – it was no wonder then that afterward I learned that Nick often does covers for Chris’s titles. Makes sense. During slow periods I’d talk to him and flip through his book of original art, all of which is stunning, and got to ask him questions I’ve been dying to ask people in person for years. For instance: in one large panel from an X-Men book involving a dragon, I noticed a drawing of a main character atop a building that was very small. Now, if it was small in the original art, it would be almost invisible in the finished comic. So why put it in? Apparently it’s mostly for the colorist, helping them know where the breaks in the colors should go. Who knew? In any event, Nick is awesome a deserves all the attention he’s getting. That, and meeting a Marvel artist for more than 10 seconds is something I’m happy to scratch off my bucket-list.